Streetwise Opera is an award-winning charity, working with homeless people to give them a platform to perform, create and make positive changes in their lives. In 2012, Streetwise Opera created With One Voice and kickstarted an international movement to help build the arts and homelessness sector globally, focussing on Olympics host countries. With Japan set to be the next hosts of the Olympics in 2020, With One Voice Director, Matt Peacock, visited the country to better understand the sector and lay the groundwork for the collaborations ahead. "Sokerissa is one of a small handful of arts projects that work with homeless people in Japan. It was set up 10 years ago by choreographer Yuki Aoki, who could no longer ignore the fact of homelessness. His troupe comprises nine men and meets weekly in a space supported by the Big Issue Foundation and in parks where many homeless people sleep. This is the only direct-action arts project with rough sleepers I have come across outside Rio –the majority of other projects work through homeless centres. "I write this blog on the back of a study trip to carry out With One Voice’s latest country review of arts and homelessness. Having spent 10 days in six cities meeting 117 people across policy, homelessness, arts and people with a lived experience of homelessness, I am reflecting on a sector that is so similar yet so different to others I have been lucky enough to encounter. "We always start these projects with a country review of arts and homelesness, so what better place to begin than in Osaka and Cocoroom where the whole scene began. Over the past eight years, Streetwise Opera has been running exchanges with the Cocoroom, with the support of the British Council, which has been a driving force and a catalyst for the arts/homelessness movement for a decade. Cocoroom was founded by Kanayo Ueda, a community activist and poet who lives and works in Kamagasaki, a district with the highest number of homeless people in the country. She began by opening a café in Kamagasaki at a time when very few people would come into the area. The café enabled homeless and ex-homeless people to connect with each other and other members of the local community over a meal, tea and arts activities. The café has now become a guest house which connects even more people, especially international travellers, with the residents of the area. Profits go to the University of the Arts and a programme of 90 arts workshops per year including a choir, visual arts, gamelan, calligraphy and drama. It’s a phenomenal programme run by a tour de force – you mention Kanayo’s name in any arts situation in the country and people nod in reverence and respect. "The homelessness situation in Kamagasaki is a snapshot of the situation in the whole country. There are around 100 rough sleepers in an area of 800 square metres, with an additional 400 sleeping in a night-shelter, the largest such facility in Japan. There are, in addition, an estimated 8,500 people living on social welfare in tiny, mostly privately owned single-bed rooms. A few are provided by the non-profit sector. These doyas are the size of two or three Japanese sleeping mats. Welfare support is available to most people in need but, in order to qualify (particularly for the pension), you have to have built up eligibility through work. When the Japanese economic bubble burst in the 1990s, the biggest job sector that was hit was construction. A huge number of construction workers lived in Kamagaski, in company accommodation, but also in similar districts around Japan such as Kotobuki in Yokohama and Sanya in Tokyo. When these day labourer jobs were no longer available, many of the men became homeless. Now 20 years on, they are among the growing number of older homelesss people. Residents of Kamagaski have the lowest life expectancy in Japan. "The message coming strongly from the meetings I’ve attended this past fortnight is that, in Japan, people’s identity is bound up with work in a way that is much stronger than in many other countries. ‘You have three things in your life’, one person explained. ‘Family, friends and job.’ And many people talked of shakai-jin – literally meaning 'society-people'. In Japan, you only really belong to society if you are useful and have a job. This accounts for a number of homeless people genuinely choosing to live on the streets – not in the same way as many of the public think homelessness is a choice but consciously deciding to get out of the rigid system with its one-dimensional values. The policy-makers bring this up themselves in meetings and shrug as if to say, ‘well, if they choose to go on the streets…’. It is clear from several meetings with local and national government that homelessness is seen as an individual issue rather than a society one. "The arts/homelessness movement in Japan is, as in most countries, passionate but under-resourced and fragmented. It is an interesting fact that none of the projects we saw in the field have enough money to pay any staff. Everyone doing this work has other jobs and they use small local government and foundation grants to fund the project costs. However, they all want to use the arts to raise awareness of the true nature of homelessness and to encourage the public to engage with the issue and see homeless people as human beings with skills and talents and not just a set of problems. "An example is the Arts Management Centre Fukuoka (AMCF), set up by Yuko Itoyama, who saw homeless people every night when she left the theatre she was running. 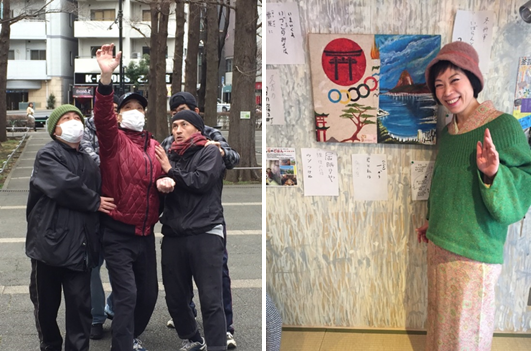 She has set up drama workshops in a shien centre and hopes to expand to neighbouring Kita-Kyushu through the Hobokukan homeless centre networks. The workshops are designed specifically to increase communication skills for homeless people as they prepare for the job market. AMCF’s dynamic drama leaders guide the participants through a fascinating process involving reading newspapers in small groups, selecting three favourite stories/adverts, finding connections between the stories, writing a poem to illustrate the connections, and then making a script which becomes a play that is acted out. "Although most mainstream arts organisations are concentrating on disability, there is a huge opportunity to forge relationships between them and the homeless sector. A particularly forward-thinking example is the Tokyo Metropolitan Art Museum which is one of nine large, public arts institutions around Ueno Park in Tokyo. Ueno Park has long been the home of rough sleepers with many using the foyers of the cultural institutions to sit down and get warm. Like many cultural spaces around the world, they struggle to know what to do – not wanting to eject the homeless people but also not engaging with them. This is an ideal group of organisations to include into With One Voice’s Cultural Spaces Homelessness Strategy paper – a review of examples of how museums, libraries, galleries and venues are engaging with homeless people and to share practice between them. This paper will be launched at an international summit of arts and homelessness in 2018 – details to be announced soon. "At all of our meetings, and through a few discussion workshops we organised with the sector, policy makers and homeless people, we talked about the Olympics and whether the Tokyo 2020 Cultural Olympiad was a good opportunity for the arts/homelessness sector. There was almost unanimous agreement from all parties that what happened in London and Rio, in giving homeless people a creative platform, should happen for Tokyo 2020. Most people thought that it would be an effective way to educate the public and promote more positive understanding about homelessness and homeless people. This was even in spite of us meeting a group of artist activists who live in Yoyogi Park who are campaigning against the Olympics. Despite this, the overwhelming feeling was that the Olympics was a chance to show homeless people in a different light. The sector is dreaming big and we will be there to support them."